Check in at Suffragio tonight at 8 pm ET for a live-blog of tonight’s leaders debate, the first such debate in Québec’s election campaign. Québec’s voters go to the polls on April 7. (You can read previous coverage of the current Québec election, the Marois government and the 2012 election here). Update, 8:00 pm: Here we go! The live-blog continues below the jump. Update, 10:00 pm: So who won? Who lost? 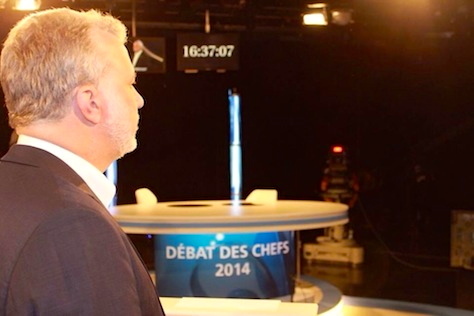 Liberal leader Philippe Couillard more than held his own in this debate — it’s hard to believe it was his first leadership debate. He was calm, he was cool, he looked like a premier. He didn’t refrain from engaging premier Pauline Marois, and he certainly scrapped over several issues, including the PQ’s proposed Charter of Values, Marois’s record on job creation and on Marois’s leadership. Marois played defense all night long, and not only because she’s defending her existing government. Her attempts to blame the previous Liberal government of Jean Charest, I think, fell flat — those attacks could have been more effective. But just about everyone ganged up on Marois tonight, and she was alternatively aggressive and defensively brittle — and that’s even before the debate turned to the sovereignty issue. It wasn’t her best night. François Legault obviously believes he has more votes to win from the PQ than from the Liberals — and it showed in the way he went after Marois. Legault took plenty of shots at Couillard too, especially in trying to defend his image as the clear champion of the private sector in the election. Françoise David of Québec solidaire was perhaps even more calm and collected than Couillard, and a thoughtful presence on the stage tonight — it’s the same tactic she used in 2012 during the debates, and it largely worked tonight, too. But she has the luxury of being able to float above the fray because her party’s in fourth place. Like Legault, she targeted Marois much more than Couillard. She was particularly effective with her deliberate answers on religious freedom and the Charter, and her attempt to reclaim the sovereignty issue from the PQ. Perhaps the biggest surprise of the night is how little revolved around the question of sovereignty and Québec independence. About half of the sovereignty section, which itself ran about 30 to 40 minutes, was devoted to the issue of the Charter. Also missing from the debate was any mention of Marois’s early attempts to rewrite Bill 101 on the use of French language, which have now fallen by the wayside with the debate over the Charter. Nothing in tonight’s debate will reverse the growing trend toward the Liberals and away from the PQ. That doesn’t mean Couillard will certainly be Québec’s premier, but he did nothing tonight to disqualify himself. Marois’s aggressive defensiveness played poorly to me, and she did nothing to help her cause along undecided voters. David, especially, may have pulled a few voters away from the PQ tonight. It will be interesting to see if she and Legault, in particular, will focus their aim on Couillard if the Liberals’ polling lead grows even further over the next week or two.